140 MHz Broadband Parametric-IF Filter for Digital Modem. Clarifying specification values of bandwidth, band middle frequency, roll off, rejection, impedance. Find out which kind of filter shall be used: Butter-worth, Tschebischeff, Cauer, Wave, Zig Zag or Parametric filter. To minimize the number of coils, a Parametric filter shout be the first choice . 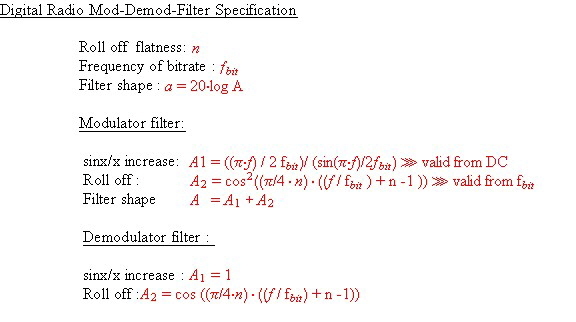 Estimation of pole and zeros and solving the filter equations with a computer software or find the filter values in a catalog. The insulation of high voltage transformers usually is measured by watching the DC-leakage current. But in molted transformers the problem of unknown tiny air bubbles exist. This bubbles my create ionization in the captive air.The corona effect may exist in a transformer for years after the high voltage breakdown will happen.The ionization bubbles can be found, watching the MHz leakage current with a scope. But this will lead to lot of mismeasurements due of added radio frequencys.To filter this radio-waves , a proper filter must used. 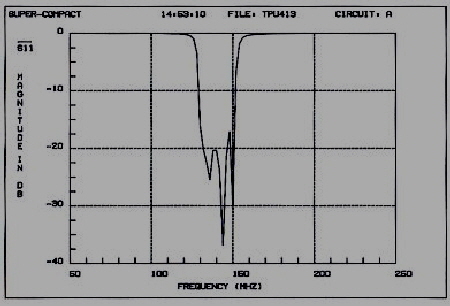 The requirement of the filter is : Fo = 1 MHz, Zin = 1 kOhm, Zout = 50 Ohm, B =100 khz, Fig. 1 shows the measurement circuit, using a sensitive oscilloscope to watch the corona. The Filter is a transforming parametric circuit using lumped components rare then an OP-active filter which could be damaged from high voltage sparks. Fig.2. Fig.3 shows S21 . The above simple 2 pole parametric bandpass can be modified to be a 10Mhz IF-Filter matched to the OP-AMP in and outputs.The input of the filter has 1 Ohm to fit to the OP-output, whereas the output is resistive matched with a 100 Ohm resistor to fit the Mega-ohm input of OP-AMPs.The series connection of two or three filters between OPs give an high selectivity If-Filter. Fig 1 shows the circuit and Fig.2 the selectivity of one single filter. C1, C8 and L3 are problem less components and may be fixed SMD-components. The circuit shows Fig 1 and is developed using a parametric filter software and Norton’s transformation. A Mixer must work into some resonating device to gather the wanted mixing products. A small filter can do this job, but it must be properly matched. We use: and find the circuit of Fig.1 where the parasitics do not affect the function as Fig.2 shows. The low output coil in a practice circuit is only a small path on the PCB and is calculated with a Q of 20. The black component values are computed values.The PCB -capacitors must be subtracted. Fig.2 S21 of Mixer filter. 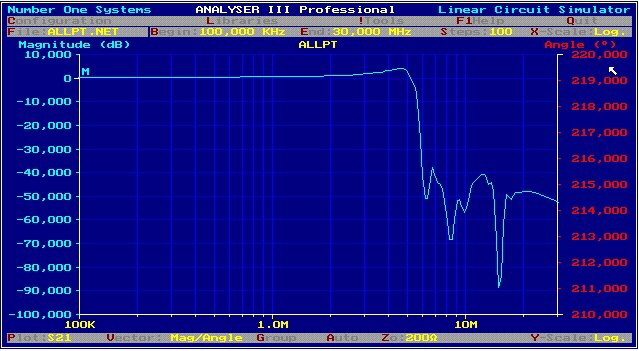 Matching values are :S11 and S22 = 12dB. 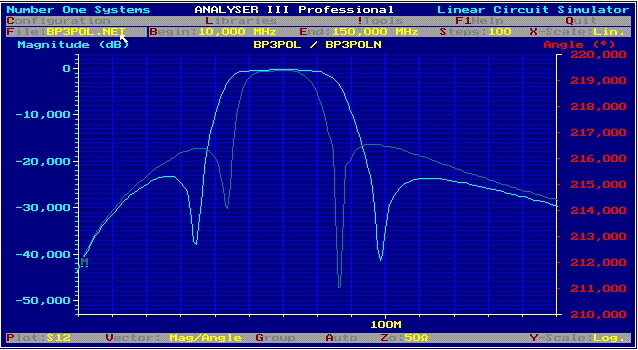 This filter is an example of filters having certain frequency poles.This example shows the high increase on rejection outside the band. We use a wave parameter filter from  having two resonators at Fo and two poles at frequencies near the band end. As we want high low insertion loss in the band, we add a third resonator at Fo. This filter is an universal filter to be changed for many purposes. For instance -narrow band -channel filter or high selectivity if filter. Impedance or frequency changing is easy. To change the bandwidth , the poles at band end must equally changed in percentage to broaden the band. This filter is easy to handle in a CAD-program, the three resonators are always at Fo and the poles can than be adjusted. This allows to build a bandwidth switch-able filter. Fig.1 shows the circuit for Fo =100 Mhz and Fig.2 the transmission S21setting Q=100 . Lower impedance on the input or output can be realized as it is well known , using taping of the first coil. The necessary data’s are: fo=140 MHz; Bandwidth 1dB =+-6 MHz, Bandwidth 3dB =+- 10 MHz , Bandwidth 20dB = +-15 Mhz. 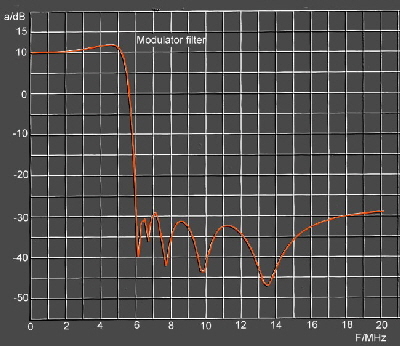 The used filter is a parametric filter having the grade of 11. The poles are : 4,1,3, Grad =11 . A PCB circuit using fixed air coils is used. To tune the filter, SMD-trimmers have been used .To manufacture a series product a lot of tolerance considerations still has to be made.The circuit up to now is shown in Fig. and the transmission S12 in Fig.4. Today , digital modulated communication channels are everywhere. Ignorant people may think its digital communication, using data jumps from 1 to zero, the same as digital logic . But this is not the case.We look how the communication bit’s look like and show how to design lumped RF-data filters for high bit rates. Look at two different digital bit’s, the hard jump and the soft cosines shape jump and its amplitude density. 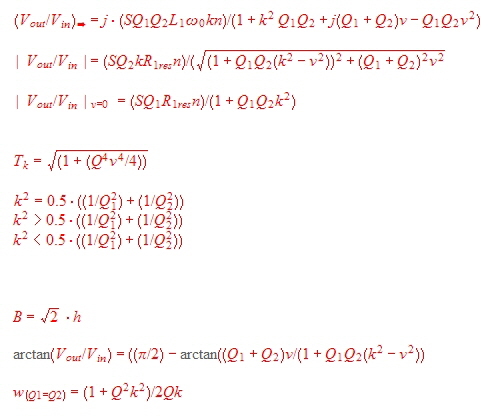 We get this density from a Fourier transformation . Fig.1. Fig. 2 shows the graphical results of this power density .The hard data bit produces power at multiples of the bit-rate. To avoid data confusion due of this unwanted power, soft square cosines bits are used in digital data communication. Mod and demod filters are both low pass filters, I use the same simple basic filter , it’s a n-pole low pass from a catalogue  and select it to match approximately the specification requirements. Now how can we get the cos roll off and the sinx / x increase? We get the roll off, by shaping the poles resonator with a resistor only damping at a certain series resonator frequency .The sinx / x increase is very easy to get. A little differentiating resistor into the infinite pole capacitor enhances the corner frequency over swing. This filter is much more easier to adjust than an full computed over swing filter without resistors, where all components my change the roll off too. Fig 5 shows one pole of the filter. 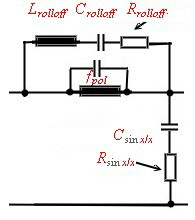 Fig.6 Shows the transmission of such a modulator filter, using 5 poles in series. At the 2 upper frequency s, the poles work without resistors..
Parametric filters need less coils than every other filter type. Here is a minimum coil broadband 70 Mhz Parametric Filter The circuit of Fig.1 is the result of computerized solving of the H(s) and K(s) equations, of a parametric filter.The components are found in a computer iteration process to nullify the equation H(s).The Circuit shows the typical C-Input of Parametric filters and has only 5 coils to get a grade of 11. Fig.2 presents the transmission . Infinit poles = 3. Zero poles =4. Finite Poles = 2. Grad = 2*2+4+3=11. RF Receivers for Digital data have three main sections, the RF section, including the input front end, the If section and a digital demodulator. As it can bee seen at PQSK-Data Filters for digital radio , the digital demodulator needs a low pass having a very tight specified cos roll off. This low pass, can be simplified, if the already existing IF filter has a cos roll off. Above, a very complicated filter has been shown, fulfilling a very tight specification. Here a 70 MHz bandpass is shown, having a cosines roll off, to fit in a somewhat wider specification: The electrical values fits SMD components. Adjustment is easy if the two poles are tuned to its frequencies. Fig. 1 shows the the circuit and Fig.2 the transmission. Fig.1 Simplified Parametric bandpass having cosines roll off. Classical Radio Band-passes have been realized by means of magnetic coupled trimmed coils in a metallic housing. A better modern design, is a capacitor coupled filter having small SMD coils used as resonators. Here is an example of a 4 resonator 70 MHz broadband bandpass to be used in a telecommunication data receiver. Fig.1 shows the circuit. As the SMD coils are not trimmed at all, three adjustment SMD capacitors are used to compensate the 5 % delivery tolerances of the coils. 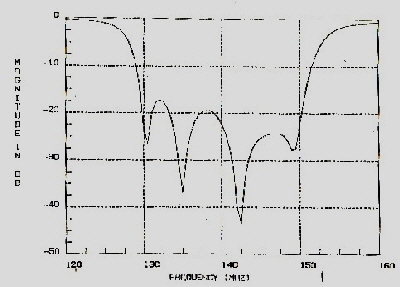 Fig 2 shows the S12 transmission at 200 Ohm matching, S11/ 22 is 20 dB. On a PCB, the coils must be placed between small flat metal shields, soldered on the PCB, to prevent magnetic coupling. As the components are very tight selected, adjustment time of the filter is only a few minutes. #1 is S12 IF all coil values at +5% . #2 is S12 IF all coil values at -5% . #3 is S12 of #1 tuned to fo using C3, C4, C5. #4 is S12 of #2 tuned to fo using C3, C4, C5. 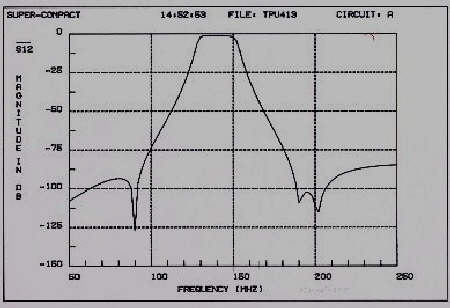 High Q Coil on a ferrite antenna having a impedance of 2kOhm to a 100 Ohm Amplifier input. It is the same circuit, but input and output have been changed. The values at fo = 80 Mhz are: C1=15pF; C2=30pF, C3=1pF; C4=2pF; C5=25pF; C6=25pF; L1=200nH; L2=160nH; L3=4uH; L4=180nH; The resonance frequency of L3 must be >3fo, therefore this coil must be realized using a high permeability RF-Ferrite, to need only 3 to 7 turns. Component Values can be scaled by fo1/fo2 to change fo. Parametric Band-passes with finite poles are a good choice for broadband data filtering .As an example, a 2 finite pole bandpass has been computed using a FORTRAN Program . The circuit was found by means of nullifying the roots with circuit elements in an interactive process. The program finds many solution circuits which all solves the roots.The designer has to decide which circuit has to be used. Fig 1 shows the chosen circuit.The output impedance is set to the 90 Ohm to optimize PCB wiring. Fig.2 shows the computed S21 transmission values for broad and narrow-band. If the infinite pole frequencies are changed using C2 and C6 synchronously, the bandwidth may be changed up to 30 % . The broadband filters shown above, are the outcome of complicated computer filter software including NORTON transformation. Here is a very simple method to realize an other type of broadband band-filter. Such simple filters have been used in the earlier years of electronics. The only thing we need for calculation is a pocket calculator. Fig. 1 shows the basic block diagram of the filter. We see between two amplifiers, which have a very high input and output resistance, one detuned L C resonator. This amplifier-resonator circuit is connected in series n times and it is assumed, that Zi and Zo are very high. The amplifier can be a FET or a Tube. If the impedances are low, they can be transformed, using coil-taps. The gain must be stable fixed, using a feedback circuit. The different Q values can be realized by using ex-tern resistors at the resonators. dvb =detuning for factor 0.7 bandwith. Fig.1 shows, how the single resonators are added together. 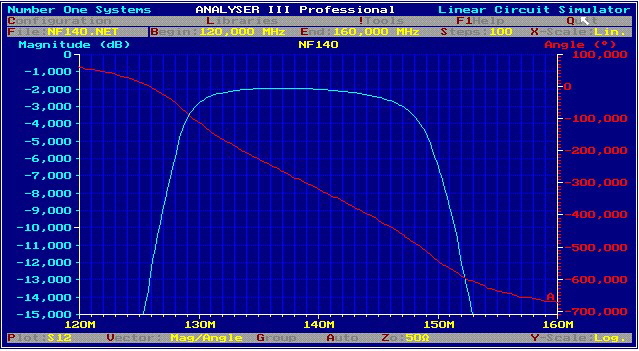 This article is written for tube radio fans, for understanding the classical radio LC, I F-band filter, which are not used any more in todays radios. This bandpass, was realized , using two high Q Coils as of part of two resonators, which are coupled using the magnetic field of the coils. Fig.1 shows the mechanical arrangement. The coils have been placed on two small plastic tubes with ferrite adjustment screws. Turning this screws, the mitt-frequency of the resonators can be changed. The distance between the coils determines the bandwidth of the bandpass. This two resonators are connected between tube amplifiers as fig.2 shows. Mitt-Frequency, fo is the frequency in the middle of the passband. Resonance resistor Ro is the paralleled sum of the real loss resistances of coil, capacitor, and adjacent tube resistors. Coupling, k = grade of coupling between the coils. in case of Q1=Q2 and k=1/Q, k is called kc = critical coupling. Fig.3 shows the influence of the coupling to the filter ripple. 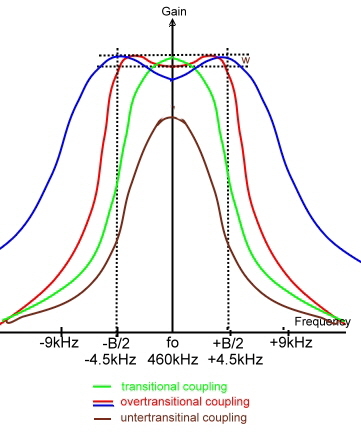 At Fig.3, 460 kHz Radio IF- Bandpass curves depending on different coupling factors are shown.The stop band attenuation at 9kHz must be as high as possible! 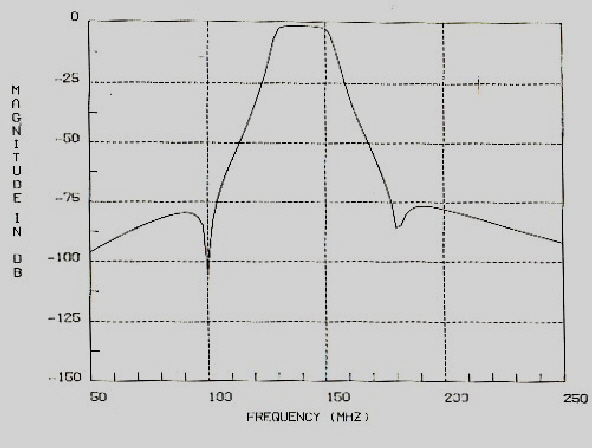 Fig.3 Radio IF bandpass curves. Computing of an electronics filter is one thing, realizing the hardware, is another, because of coils quality and self-resonance. 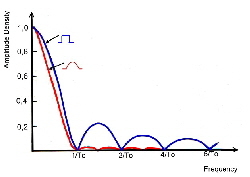 Fig.1 shows this coil losses. Before build up the hardware, the filter should be tested with the coil-datas and its parasitic values, in a CAD Program. 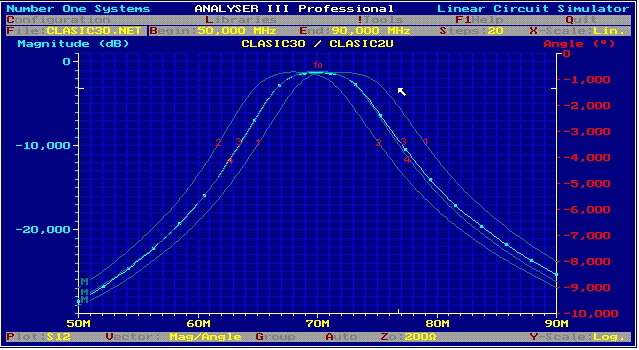 ______The red line shows the maximum possible Q for coils made out of single wire windings on ferrite. 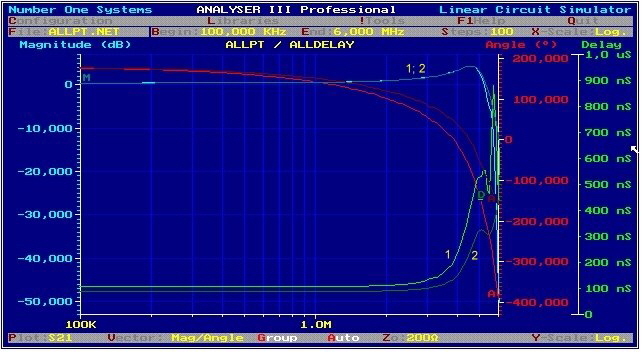 _______The green line shows the maximum possible Q for coils made out of RF litz (stranded) wire windings on ferrite. For red and green coils, the optimum ferrite should be used. 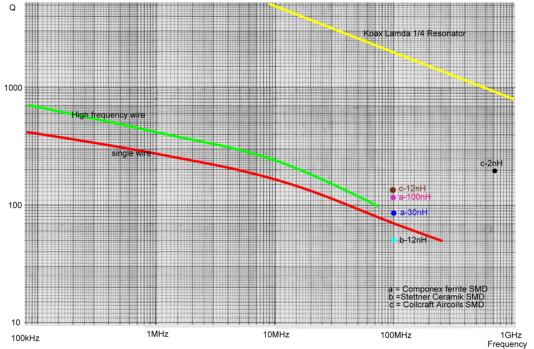 _________The yellow line shows the maximum possible Q for lambda /4 resonators. The single points are examples of SMD coils. We see in the frequency range between 100 MHz and 2 GHz, only air coils and coax resonators have high Q values. . As coaxial resonators with high Q values are very bulky, the only solutions are air coils especially SMD air coils. That is, the filter tuning must be made with capacitors. 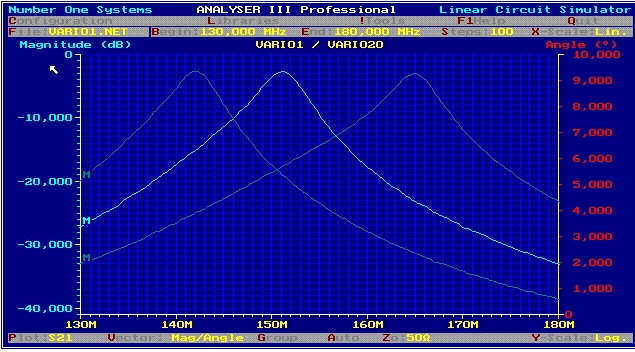 Fig.2 Gain of parametric MHz Bandpass, ao=1,8dB. 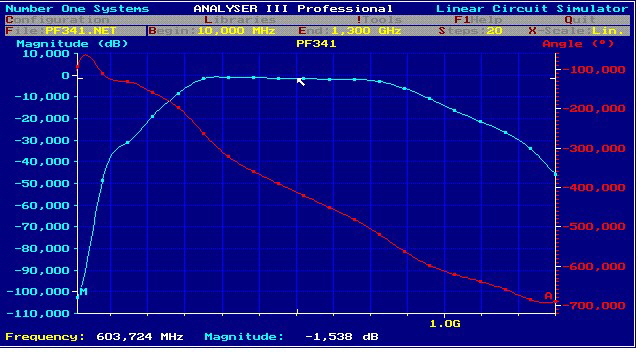 Fig.3 Input-output-reflection of parametric 140 MHz Bandpass. 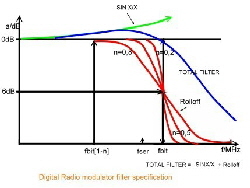 Simplification of the 140 MHz Broadband Parametric-IF Filter for a Digital Modem. 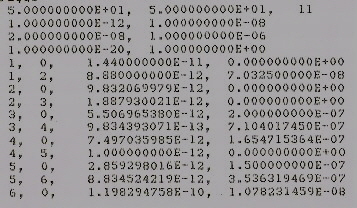 If C10, C12, L8 of Fig.1 are set to 0, C11and L9 to infinite, the Norton Transforming program tries to find positiv finite other values. After working a few hours, with norton, we get a simpler circuit. Fig.4 . The out of band rejection is even greater. Fig.5. As the capacitor data shoes, all capacitor values to ground have been made with the Norton-programm relatively large. Therefore, the Filter-PCB has a full grounding layer. The actual C values than must be smaller than the parasitic values from the board. As Fig 4 shoes, the filter has a dimension of 6 cm * 2cm. To get the ground really cold I have soldered two angel plates along the board at the ground side. 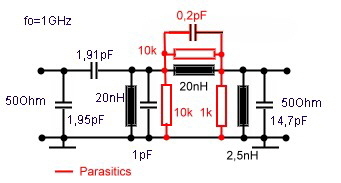 To prevent parasitic inductance the string from input to output must be made very broad. The hard ware was tested an I got nearly the computed values. Fig. 7 Test-PCB of the parametric Bandpass filter, (about real) size.